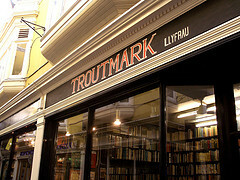 Secondhand bookstore nestled away in one of Cardiff's many bustling arcades. From the bell that tingles when you open the door to the jazz playing softly on the radio, this is a shop that oozes character. Spread over three floors, Troutmark is perfect for browsing during a lunch hour - or an entire afternoon. The shop is lined wall-to-wall with books on subjects from art and history, politics, psychology and biography to poetry, popular fiction and the classics. Upstairs even boasts an impressive archive of old magazines and periodicals, charting as far back at the late 1980s. Troutmark offers a wide range of affordable books, and a friendly and knowledgeable staff: the perfect place to lose yourself.